Wales have a lot to be happy about in the aftermath of their World Cup. True, they came home with a 4-3 record, but this is cup rugby. If you don’t win them all, it’s better to come home with a 4-3 record than a 4-1 record: playing seven games is a better result than playing five. Secondly, all three of the games they lost were by narrow margins: a single point to the South Africans in the group, a single point to the French in the semis, and three points to the Aussies in the more-or-less redundant third place play-off. Give that they goal-kicked pretty ineffectively in all three of those matches, some better skills off the tee could have conceivably seen them all the way to the final. Much has been made of the age-profile of the Welsh team. Their backrow is composed entirely of nippers, both second-rows are in their twenties and bar veterans Mike Phillips  and Shane Williams , all members of their first-choice backline are under 25 years old. They’ve got some great building blocks in place. The Mole was of the opinion last season that in a few years the Welsh backrow would be a cracking unit; he in no way expected them to be so accomplished so soon. Dan Lydiate went from being an ordinary looking blindside to Simon Easterby v2.0, and Faletau just exploded. His performances in the World Cup were sensational – explosive pace, good ball-skills and unbelievably reserves of energy. It’s worth noting that there are some seriously good young players knocking about in the shadows of Warburton, Faletau and Lydiate: Justin Tipuric  of the Ospreys is a top quality openside who seems destined to spend his career in the shadow of Eagle Sam, and Big Ben Morgan [also 22] of the Scarlets is a huge lump of a ball-carrier at No8. He offers something different than Faletau, in a similar way that Picamoles offers something different to Harinordoquy. Morgan shared gametime with former Wallaby No8 David Lyons last season; when the Scarlets visited the RDS last season to face Leinster, the Mole was moved to comment on just how well Lyons was playing, only to find out after the game that the scrum-capped No8 was actually a Welsh 21-year old, not a 44-times capped former Australian captain and John Eales medal-winner. Morgan is going to be a serious player, but didn’t even make the World Cup squad. Then again, nor did Martyn Williams. At second row, Luke Charteris hit undreamed of levels of performance in the tournament. He has always been looked on with suspicion because of his gangly build, but with one tournament he has justified the faith put in him over the years. His lineout work was generally very effective, as you would expect from somebody who tops out a 208cm [6’10”], but it was his workrate which was an eye-opener. He fully deserved his spot ahead of Bradley Davies, who is no mean player in his own right. Gethin Jenkins has been around the international stage a long, long time, but is surprisingly still only 30 years old, despite the 82 Welsh caps he has to his name; Adam Jones is even younger, and has 77 caps to his name. Jenkins has already talked about wanting to be in the mix for the World Cup in four years time, and neither of these players need replacing in the near future. It’s entirely pausible that both players will still be around for the next tournament, but even a worst case scenario sees them providing serious competition over the next few years for any props looking to break through and stake a claim for their jerseys. There were so many good performers in the Welsh backline – Jamie Roberts and Mike Phillips were just about the best players in their respective positions over the World Cup, and Rhys Priestland’s game against Ireland was the most complete outhalf’s performance of the entire tournament. Little Leigh Halfpenny proved himself as a serious fullback, rather than some half-wit slashie with an exaggerated opinion of his abilities and/or importance to the team. Too often wingers say that their favourite position is fullback. Maybe that’s because they played there in school or down the grades, got their hands on the pill a lot and ran through a bunch of kids on their way to a pro career. Maybe – and the Mole partially subscribes to this theory – it’s because winger is, as a position, the dumb blonde of rugby: wingers want to be taken seriously for their all-round footballing prowess, rather than simply making the most of their speed and finishing abilities. Halfpenny [much like Ben Foden before him] surprised the Mole with the abilities he showed under the high ball, with his defensive solidity, strength in contact and strong kicking game. Still, for every Little Leigh to prove the Mole’s theory wrong, there are Ugo Monyes and Luke Fitzgeralds to prove it right! James Hook’s World Cup experiences make for interesting thought-patterns. Going into the tournament, he was seen as the Welsh player for whom to watch out. Neil Jenkins thought that he would nail down the No10 jersey in the World Cup, and Phil Bennett, one of the true Welsh greats, thought that he simply had to be included in a play-making position, be that at outhalf or first centre. In the aftermath of the World Cup, Hook is now at something of a loss with regards to his international future. Consistent gametime at outhalf in Perpignan will give him the base camp from which to launch his attempt at the Welsh No10 jersey, but on recent evidence Priestland is simply a better outhalf than him. You’d also have to say that Halfpenny’s performances at fullback were more threatening in attack and more solid in defense than Hook’s efforts. Inside centre then? You’d be absolutely bonkers to drop or move Jamie Roberts from a position where he has hit two phenomenal peaks in big tournaments and tours. It could be that Shane Williams’ nearing retirement opens up the left wing jersey for the first time in a decade, and that Little Leigh takes over in the Youths-sized No11, with Hook coming back in at FB. On the other hand, Tom Prydie could come back into the shake-up. Before George North was parchuted into the Welsh squad directly from secondary school, Prydie was Gatland’s enormous teenage wing sensation. He’s the youngest player to play in both the Heineken Cup [for the Ospreys, at 17 years old] and the Six Nations [at 18] … and he’s still only 19! Second centre is a position that may be a little more up for grabs than it might seem, especially to Irish rugby fans who suffered at the hands of JJV Davies. It’s impossible to forget Davies’ match-clinching try in the quarter-final, and the temptation is to let that lie in your memory as representative of his tournament, rather than the pinnacle of it. The big Llanelli lad had a fine World Cup, but was overshadowed by Jamie Roberts’ performances; for the Mole, the idea that Davies is a No12 playing in a No13 jersey is never far from the surface of his thoughts. Now, there are two distinct perspectives on the Roberts/Davies combination. One take says that they don’t play as a centre partnership, and that the Welsh attacking strategy reflects this: if you knock down a charging Roberts in the 10/12 channel, the Welsh can just give you more of the same off the next ball, with Davies taking the crash. They’re both big, fast men with good offloading skills, and rely on other people – normally the halfbacks – to set up their runs, rather than setting up each other. I think if you compare the playing style of the O’Driscoll & Roberts partnership for the 2009 Lions with the Davies & Roberts partnership for the RWC11 Wales you’ll see the difference. Essentially, they’re carbon copies of each other, and the Welsh game plan reflects their skills and physical abilities. They’re both very difficult players to deal with, and it means that you can’t focus your energies on game planning for just one of them, because the other guy can do the job just as well. The other choice would be that you introduce a complementary centre to try and make a partnership that brings out the best in each player, rather than have two similar players performing the same role in the team. If that sounds risky [in the ‘if it ain’t broke, don’t fix it’ mould] it’s worth bearing in mind the huge positive effect that a genuinely complementary partnership can have – Ma’a Nonu and Conrad Smith, Carling and Guscott, Horan and Little would be cases I’d bring forward in evidence. The surprising truth is that Gatland has a wealth of options open to him in this regard. The introduction of a rounded playmaker at second five-eighth, or the type of ‘inside winger’ in the No13 jersey best typified by Jaque Fourie … he has the players available to him to examine both models. 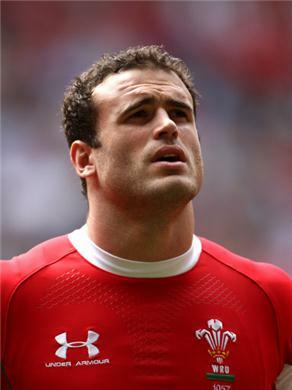 Hook could be brought in at 12 [suspend your disbelief at the thought of Jamie Roberts being moved or dropped!] or – and this is distinctly more likely – 21-year old Scott Williams could emerge as the Welsh No13. He plays there for Llanelli outside JJV Davies and has abilities better-suited to outside centre than his clubmate … notably real pace. The lad has a set of wheels on him that make him a bit of a nightmare to defend. Having written all that, I think it’s time to take a Kent Brockman-esque stance and welcome our new insect overlords. The Welsh Rugby Union are already crowing about ‘a new golden age of Welsh rugby’, and everything seems set for them to kick on from this tournament and establish themselves as the premier force in Northern Hemisphere rugby. However, there’s many a slip twixt cup and lip. As a rugby nation, the Welsh have a famous history, but there’s a strong body of evidence to suggest that the professional era has accompanied a loss in standing of the game in Wales. The Welsh national team pack out the Millenium Stadium as they used to pack out Cardiff Arms Park, but you would have to be either naive or have very low standards to think that their club game is a success. The formation of professional teams in Wales was a raggedy, controversial exercise in comparison with the rather surgical establishment of the provinces as representative entities by the IRFU. The likes of the Ospreys, Cardiff Blues, Newport-Gwent Dragons and Llanelli regularly play in front of half-empty stadia, and are irregular competitors in the knock-out rounds of the Heineken Cup. Why is that relevant? You can’t maintain a peak forever. If you’re training for a World Cup, you don’t have other targets to hit – you aren’t thinking about derby games in the Pro 12, or the home-and-away weekends of the Heineken Cup. The Welsh clubs aren’t headed by coaches of the same calibre as Gatland, Edwards and Howley. One of the traditional Welsh weaknesses has been their standards of fitness; a second has been their fondness for the grog – if you think that’s unfair, consider the recent escapades of Powell, Phillips and Leigh Byrne, as well as the one and only Gavin Henson. Getting up a 5am and training four times a day is not a regime that many players can handle for an extended period of time. They get bored and they get injured. Gatland and the S&C staff got the Welsh preparation absolutely right for the tournament, but they won’t be afforded the same access nor the same leeway for the Six Nations. This entry was posted in Report Card, RWC 2011 and tagged Big Bopper Jamie Roberts, Cuddly Warren Gatland, Dirty Leeds, Land of our Fathers, Little Leigh, Sam the Eagle, Skyhook Charteris, Wales by dementedmole. Bookmark the permalink. The Taffes were on a self-imposed teetotaller trip, seems to have paid off very well for them. It will be interesting to see where they go from here. Essentially Roberts and Davies are too very good Phil danahers then! I agree with your analysis almost completely here, although I’m predisposed against the idea of a playmaking 12 (especially for Wales when they’ve two top drawer gritty 12s). I’d see halfpenny as a potential 13 and not sold on young Williams yet. I am sold on Priestland, hell of a player and his emergence is probably worse news for Stephen Jones than hook, who will most likely continue as a utility back. If priestland stays fit, Jones may not play much more for Wales. They are sitting on arguably the best backline going round. Have you seen Matthew Morgan (think that’s his name, he is like a shane Williams at fly half) playing much? Joy to watch in the little I’ve seen of him.